When it comes to operating a farm, one thing you might not always think about is your record keeping. But after all, a farm is a business and it still requires the same record and bookkeeping that any other company would in order to keep things straight. When it comes to your agricultural development needs, there’s only one name you can trust to aid with your record keeping: AGPROfessionals. Our Greeley, Colorado based team has a passion for agriculture, developing, and advocating for local farmers across Colorado. In addition, our in-house brokers help aspiring farm owners and operators to find, buy, and even sell farmland in Colorado, Kansas, Montana, Nebraska, New Mexico, Nevada, South Dakota, and Wyoming. We take great pride in serving these agricultural communities in order to help them build and harvest a sustainable, successful business. When it comes to record keeping on your farm, you’ll want to be sure you have all of the tools and resources needed in order to keep everything straight. 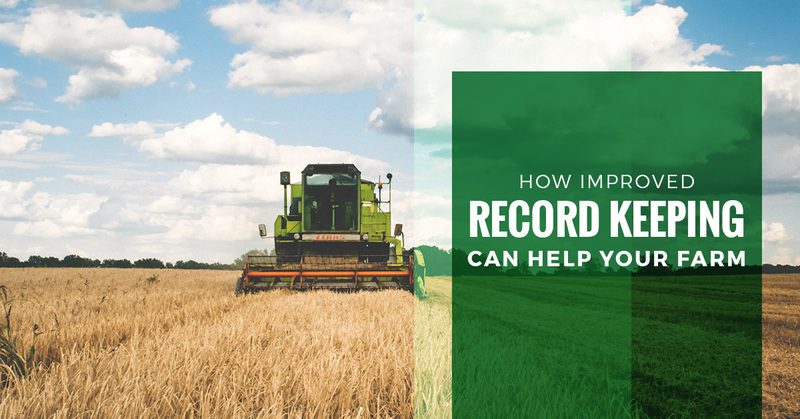 Here are a few things to know about record keeping, and more importantly, how it can help your farm. Simply put, record keeping is the process of logging and documenting the history of your activities (in this case, with regards to your farming business), such as financial dealings and tax data. This is usually done in a journal, ledger, or filed away in other documents for safekeeping. Having sound and accurate records not only can help you plan for the future of your farm, but they can also come in handy when the time comes to do your taxes, a land assessment, or to provide historical data. Most experts suggest that all records of income or deduction expenses should be kept for a minimum of three years, purely for income tax purposes. That’s because the IRS has a statute of limitations of three years when auditing a return. Keeping records of every transaction, document, and event can seem like a tedious task. However, it is also a crucial component of managing your farm at optimal efficiency. With well-documented records, you are able to monitor the progress of your farm, whether it’s a family business or a simple hobby, in order to assess where you stand in regard to your goals. You should have developed a business plan — if you need, you can get the help of an agricultural development professional to do so — and improving your records can help you compare your progress to the data you laid out in your plan. Furthermore, financial records can come in handy when the time comes to put in for a loan, a loan renewal, or for any other situation in which your bank will be involved. Advanced record keeping can allow you to keep your financial ducks in a row, so to speak, so you can easily pull reports and documents with ease. When it comes to efficient record keeping for your farm, there is a chance you’re going to need some help. If that’s the case, then at least you know you can trust the team at AGPROfessionals. Part of our agronomy and environmental development services include record keeping, which can help you mine your land for many years to come. Call AGPROfessionals today for more agricultural development help. We’re here for you!